World Happiness Report Says Nicaragua Made Great Gains In Happiness. Nicaraguans Aren't So Sure The latest World Happiness Report says Nicaragua made the greatest gains in happiness of any country — to the surprise of some Nicaraguans. 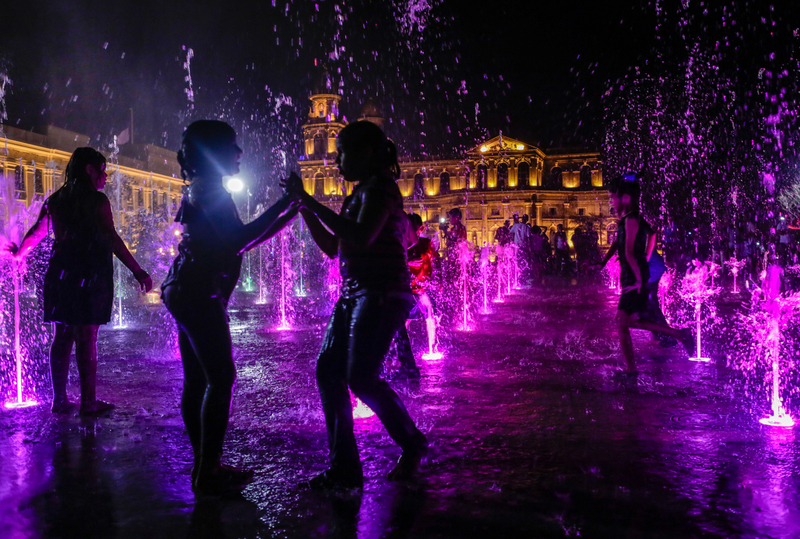 Children frolic at a plaza with a fountain in Managua. On a scorching afternoon in March, Agner Balladares Cardoza drives along Managua's chaotic main road, the Masaya Highway, jammed each day by the city's stressed-out commuters. Balladares, 36, is the father of a 6-month-old girl. He has no formal job and makes his living selling whatever he can get his hands on — pants, used car batteries, baseball caps — and by working as a driver on occasion. When he has nothing to sell and no one to drive, Balladares stays at home and takes care of his little girl. This afternoon he's weaving quickly through traffic for a woman who hired him to transport groceries to her home. Abruptly accelerating to merge into an open space, Balladares muses that, for him, happiness would be having steady employment so he can provide his child a decent life. "I don't feel fully happy," he remarks. "I don't have a formal job and that has a big impact on my life." "Besides," he adds, "in this country we see so much tragedy, misery and misfortune all around us. That does not inspire happiness." Yet Balladares lives in a country hailed as making the greatest gains in overall happiness in the World Happiness Report 2017. The report surveyed 1,000 people in 155 countries. Questions touched on quality of life, income and health as well as perceptions of freedom, honesty and generosity and their trust in business, government and fellow citizens. Balladares is not the only Nicaraguan with cause to be unhappy. The Nicaraguan Central Bank puts unemployment at 9.5 percent, but the Nicaraguan Foundation for Social and Economic Development (FUNIDES) estimates the rate to be 20 percent for people under 30. A survey conducted by FUNIDES in 2016 revealed unemployment to be Nicaraguans' greatest worry: 44 percent of respondents listed it as their primary concern. That's not the only unhappy number in Nicaragua. The percentage of the population living in poverty is about a third: 29.6 percent according to government statistics, 39 percent according to research by the International Foundation for Global Economic Challenges (FIDEG). The World Bank warns that despite progress, "poverty remains high .... Nicaragua is still one of the least developed countries in Latin America, a country where access to basic services is a daily struggle." This reality is apparent even in tourist attractions like León, a colonial city in western Nicaragua. The regal beauty of León has drawn visitors from across the globe, leading to a recent boom in hotel, bar and restaurant business. A university city, Léon's historic streets are packed with young people. They play soccer in the parks and lounge in the majestic church squares. León's joyful, postcard image contrasts, however, with the reality of the sprawling slums surrounding it. In León's "Tomás Borge" neighborhood, María Marcela Calderón lives in a shanty built from plastic sheets and cardboard boxes. Here there are no paved streets, no sewage system, no electricity or potable water. Dust, hunger and oppressive heat are a daily reality. 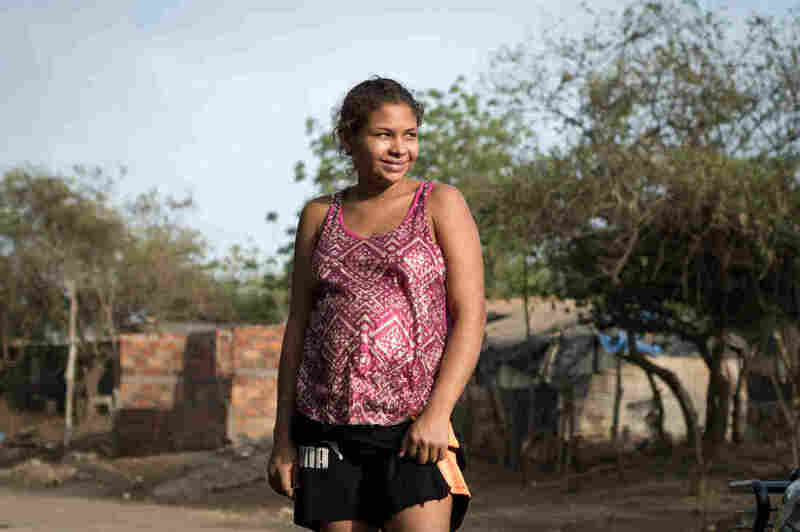 María, only 19, is the mother of a 3-year-old girl and is five months pregnant with her second child. The teenage mother — whose education ended in the sixth grade — is desperate because neither she nor her husband, Jayson Soto, are employed. At 21, her spouse spends his days lazing in a hammock, dreaming of crossing into Costa Rica to find a job, where hundreds of thousands of Nicaraguans hope to go to flee the nation's poverty and chronic unemployment. María stands outside her house on a blistering early April afternoon, beads of sweat running down her face. She looks confused, then incredulous, when I inform her that — according to an international report — Nicaragua's population has experienced a notable increase in happiness. I ask if she considers herself happy. "No," she responds bluntly. "Look at the situation we live in. This is hard. We have so many needs and no money for our children." Little Dayana, her feet caked in dust and dirt, runs circles around her mother in the dry cracked earth. María's toddler plays happily in her mud-stained clothes, oblivious to her parents' poverty. Her mother looks at her and smiles. "My child is my happiness," she reflects, tickling the girl's belly. "She is a blessing from God, the most beautiful gift God has given me," the teenager explains. Beyond its economic issues, Nicaragua is also plagued by widespread corruption. The 2016 International Transparency Report gave Nicaragua the third-worst ranking for corruption among Latin American nations and gave it low marks overall: tied for 145th in its list of 176 countries. Members of the political opposition allege that President Daniel Ortega and his wife, Vice President Rosario Murillo, control all public institutions and exercise authoritarian power, threatening democracy and basic civil freedoms. Violence against women is a public health concern. In the first three months of this year, 13 women met violent deaths, some particularly disturbing. In March, Vilma Trujillo García, 25, was burned at the stake in a remote community in eastern Nicaragua. A group of fanatic religious followers accused her of being "possessed by the devil." Two other women in the area were burned by their husbands, who accused them of being unfaithful. They didn't die but were disfigured. So how can Nicaragua be happy? "I find happiness in my actions," says Fabiola Tercero, a philologist who lives in Managua, Nicaragua's noisy and largely ugly capital. The city is plagued by poor public transportation and choking traffic. There is a shortage of sidewalks and there are no lanes for bicycles. Tercero, 30, participates in a group initiative aimed at making Nicaragua's capital more pleasant. Over Facebook, Tercero invites others to join her group in Managua's parks for social activities that include outdoor exercise and eating healthy food. "If you ask me if I am happy, there's more than one answer," Tercero says. "I am not happy about the abuse and violence women face. I am not happy about the corruption of our authorities," she continues. "I am not happy about poverty." Yet Fabiola Tercero views the future of the country optimistically. "I think today there are more opportunities," she says. "That more parks are being built or restored is something very positive." "We have to focus on the positive things life has to offer," suggests the young city woman. "Happiness is relative," she says. And despite the country's problems, she is relatively happy. Carlos Salinas Maldonado is a journalist and international correspondent in Managua. Reach him @CSMaldonado. Carl David Goette-Luciak is an anthropologist in Managua.